Blurb: Loralei takes extreme measures to prove her cheating husband has forsaken their bows by seeking confirmation from a fortune-teller. The truth revealed is that she’s been unfaithful in a six hundred year old spiritual marriage. Samael, the Angel of Death must assist a young girl’s soul in ascending to heaven. An unexpected encounter with his estranged wife distracts him and the precious soul is lost. Working together to save the endangered soul, they find the price to reach her is higher than they both anticipate. Blurb: Jeff Austin-LeGrange has been fleeing from the remnants of his dark and haunted childhood his entire life. The past always catches up to us, and his is no exception. Alice Hopkins, Jeff’s high school sweetheart, has tried to forget him and tried to move on. You never forget your first love. When Jeff’s mother dies and Alice’s father falls ill, the two are forced to confront their mutual history and their deepest desires. One thing is sure: neither of their lives will ever be the same again. Perhaps, the past can be overcome. Perhaps, it is not too late to believe in miracles. Perhaps, more than one couple will be reunited this Fall. Who can say? With a little magic, anything is possible. Blurb: Fiona Mikolas is an outcast, branded by her fiery red hair and a purple birth mark—both signs of the devil. Two years earlier, she survived an influenza outbreak that claimed her peddler husband, Gregos, and her baby son, Tito. Now she lives a solitary life, traveling a circuit of southern states in America and selling healing potions. Until the night of All Hallow’s Eve, when her lonely life is changed by the arrival of two strangers in her camp. Beaten and robbed, rancher Hagan Fletcher stumbles toward the light of a campfire in south Texas, intent on finding a way to retrieve his stolen stallion. When he awakens, he’s forgotten his name and how he came to be in the company of an exotic beauty. Fiona’s ways are a mystery but when her quick-thinking saves his life again, he looks deeper beneath the surface to who she really is. Those are words that break her. When the person you love most is gone, how do you let go? And, more importantly, who will you be once you do? Blurb: Spending Friday night in an abandoned amusement park sounded like an awesome idea to motherless, teenage track star, Remy Bordeaux—empty rides with no queues, and time alone with his best friend’s alluring sister, Rafaela, was sure to make for a memorable night. But Friday night at Six Flags became memorable for all the wrong reasons when the park turned out to not be so abandoned after all. Rafaela goes missing after getting cozy with Remy, and everyone thinks that Remy is responsible, even his best friend. It will take another trespassing trip to Six Flags for the truth of Rafaela’s disappearance to be revealed and for the riddle of Remy’s birth to be unraveled. Blurb: Something, or someone, pulled Miranda to purchase the old carriage house. It was a great deal, most likely because of the cemetery or the unexpected resident, Thomas. The ghost she finds within the sanctuary of her new home should have scared her. Instead she finds herself falling in love with him. Now, a few days from Halloween, Thomas continues to push her to live her life. He wants one night though; the one night of magic for the dead. Torn by her love for Thomas and her need for reality and human contact, Miranda takes a chance with Sean. Someone who’s alive. The guilt is eating away at her. Sean’s nice and he hasn’t run off yet, pushed away by her craziness. Miranda knows she can’t split her herself. Choosing her heart’s desire doesn’t seem possible, but living and loving another seems like a life riddled with pain. Blurb: Aggie Pierce owns a quaint little spot, the Spooky Hollow Cafe’. Tourist come from all over the nation to her confections diner for the entertainment. Real live interacting ghosts make appearances once a day, you just don’t know when. But, when a ghost’s crush becomes an obsession, just how far will a hero have to go to save Aggie’s life? Blurb: After years of having her college boyfriend Sean as an ex with benefits, Julie believes he is finally, irrevocably out of her life. Forever. And it breaks her heart. Until one night he shows up at the neighborhood hangout—with a mysterious job, luxurious car, and fabulous digs. Not to mention a new determination to woo Julie. Even as her mind says no, her heart—and other parts of her body—is saying yes, yes, yes! 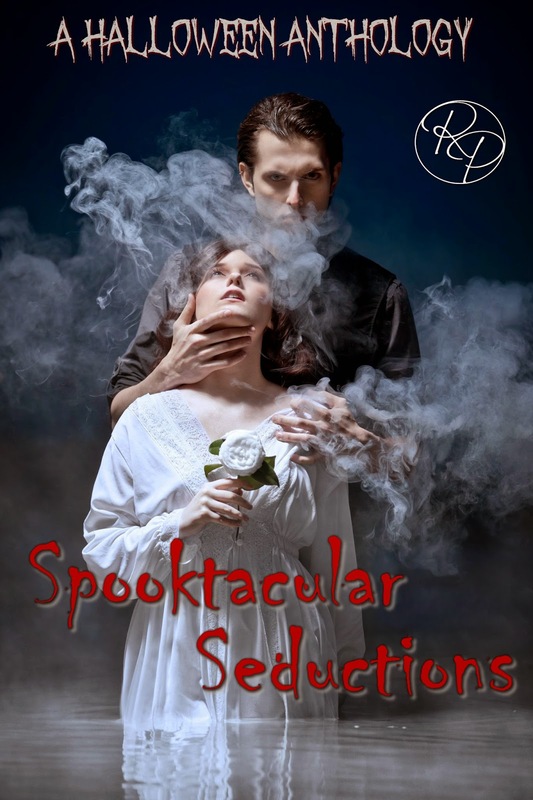 Spooktacular Seductions blog tour is now scheduling! If you’re interested in hosting our authors, please click on the tour button above.